Directed and shot by Les Blank, Werner Herzog Eats His Shoe is a documentary short film in which German filmmaker Werner Herzog fulfills a bet that he loses to another filmmaker in Errol Morris. The film chronicles what Herzog had to do after seeing that Morris had finally made a film that would be the documentary Gates of Heaven as Herzog would show what he had to do to live up to promise. The result is a hilarious documentary short film Les Blank. 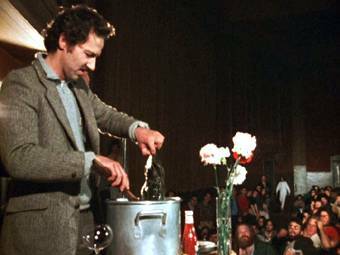 The film follows filmmaker Werner Herzog who arrives to San Francisco for a screening of Gates of Heaven to spread the word about the film as well as eat his shoe in front of the public following its screening. Throughout the course of the film, Herzog comments on the industry and his views on film as he would stop at a restaurant to cook his shoes. With footage from Charles Chaplin’s film The Gold Rush, Herzog’s own film Even the Dwarfs Started Small, and bits of Errol Morris’ Gates of Heaven interspersed with Herzog holding his public feast of shoes. Shot with hand-held cameras by Blank, the film has Herzog making humorous anecdotes about what he’s about to eat as well as the recipes he put into his shoes to give it taste. With the aid of editor/sound recordist Maureen Gosling, Blank would put in footage of other films to play into everything Herzog is about to get himself into. Yet, it is all about honoring the wager that he had with another filmmaker all in the name of cinema. Werner Herzog Eats His Shoe is a delightful film from Les Blank. It’s a very witty and enjoyable documentary short that follows a revered filmmaker doing what he says he was going to do as well as provide his own views on the world of film and the industry that often doesn’t take risk. In the end, Werner Herzog Eats His Shoe is an incredible film from Les Blank.